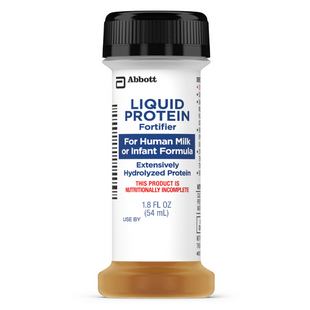 The first and only commercially sterile, extensively hydrolyzed liquid protein fortifier for preterm infants who may require additional protein. Use as directed by a physician. Designed to be mixed with human milk, fortified human milk or formula feedings with minimal displacement for any infant who needs additional protein. Helps customize feedings so preterm infants can receive the optimal protein level to meet their specific needs. Extensively hydrolyzed liquid protein fortifier for easy digestion and absorption (the same protein source as Similac® Alimentum®). This product is nutritionally incomplete. Must be mixed with human milk, fortified human milk, or formula before feeding. Enteral use only; not for IV use. 2 Centers for Disease Control and Prevention. Enterobacter sakazakii infections associated with the use of powdered infant formula—Tennessee, 2001. Available at http://www.cdc.gov/mmwr/preview/mmwrhtml/mm5114a1.htm. Accessed May 28, 2010. The health of the infant depends on carefully following the directions for preparation and use. Proper hygiene, handling and storage are important when preparing infant feedings. Pour Liquid Protein Fortifier into medicine cup. Draw up volume specified by a healthcare professional into a single use oral syringe. Dispense into measured human milk or formula and swirl. Pour desired amount of mixture into feeding container. Fortifier: Refrigerate after opening; use within 72 hours or discard. Fortified human milk or formula: Once mixed, refrigerate and use within 24 hours or discard. Water, and Casein Hydrolysate (Milk).